Video can be a powerful tool for enhancing your online presence, especially if you take the right steps to optimize your content. However, businesses who want to add video to their SEO strategies need to first ask themselves if their current website is optimized for search engines. It’s not enough to just add a video to your site without considering important factors like well-planned navigation, site structure, internal site links and title tags. If your website does not have a good crawlable structure, and your videos are not easily accessible from the first page, then visitors might not be able to find them. While videos in themselves are great for increasing engagement, trust and conversions, your return on investment (ROI) will be minimal if visitors cannot access them. How Can Video Enhance Website SEO? It has been revealed that it is 53 times easier to reach page one of Google search results with a video than it is with a web page 1. The greater visibility can be demonstrated with a study conducted by Moz. 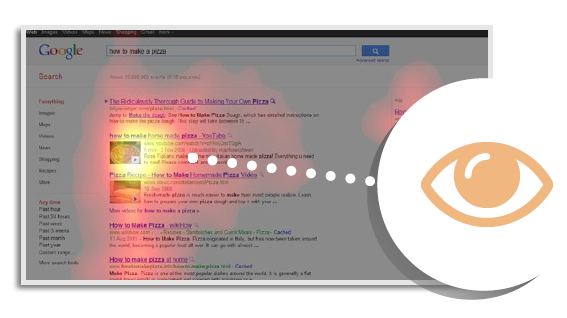 Using eye-tracking systems and heat maps, Moz researchers collected data from the search engine results pages (SERPs) of pizza shops. When they looked up “how to make a pizza,” they found that viewers went directly to the first video thumbnail on the results page, and then to the text underneath, in an “F” pattern. 3. How to tag your videos with your metadata to enhance your online visibility.